Vege meat made from soy beans, but it is just like minced meat! You can have hamburgers, meat-balls, dumplings and many other dishes without using any meat. Even though the only ingredient used is soy beans, vege meat is surprisingly tasty and filling. This type of vege meat can be used exactly like minced meat in a lot of dishes that are popular with children. 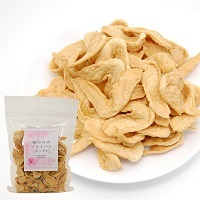 It can also be prepared in various styles of cuisine such as Japanese, Western or Chinese, and it is a simple but a great source of soy bean protein.